One of Orangeville's newest businesses has set up shop on Robb Blvd. 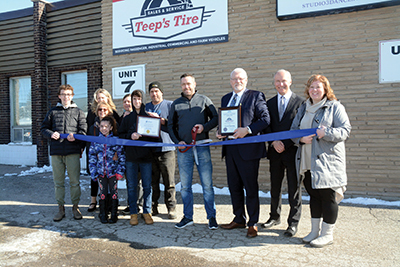 Teep's Tire held a grand opening on Monday, April 1, to let customers know that they are open for business and ready to serve the public with all their tire needs for both cars and trucks. The facility actually started operating in November and held a soft opening, but with the busy winter season they were kept hopping for a few months. Mr. Teeple said they hope to expand to the truck side of the businesses as well. Servicing big rigs on the road is an important part of the trucking industry. The shop is now open by appointment. Teep's Tire is located on Robb Blvd, facing C-Line in Orangeville.